Some days back Google unveils its own social network, Google+. Google started using it’s subdomain for Google+. If you check your google plus profile address then it’s like numbered username which makes it difficult to be shared with your friends. So here is web service called gplus.to which make your lengthy profile name shortened and to make it look like http://gplus.to/username. 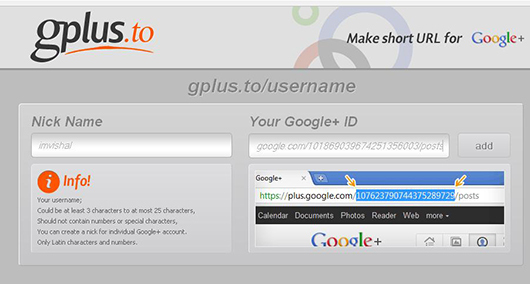 Gplus.to is a profile address shortening service for the beta version of the Google plus. Gplus.to free of charge. Gplus.to not want your personal information in any way. Gplus.to is not a Google product. 1. Visit Gplus.to official website. 2. In the Nick Name field, Enter your desired username which you want to have. 3. Login to Google plus account & copy your Google ID (only the highlighted part as shown in the image below). 4. Click Add and you’re done. Note : Google engineer has advised people to avoid using this service. He said “It is not a google service, we do not know if they are reputable and potentially they may redirect your URL to some nasty page if they choose to”.